We just can't look away from the beauty! Red roses for Valentine's Day are the ultimate romantic gesture. Your loved one will be head over heels. This gift is a classic expression of romance that will let your sweetheart know your heart's most sincere intentions. Long stem red roses are gorgeously presented among lush greens with a classic clear glass vase. 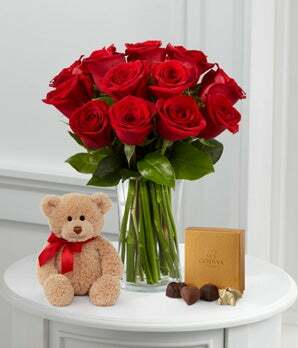 Accompanied by a 10-inch seated plush bear and a 4-piece box of Godiva® Chocolates, this gift is one that will have your special someone with you day after day and year after year.